Well, we got an inflation target from the Fed. 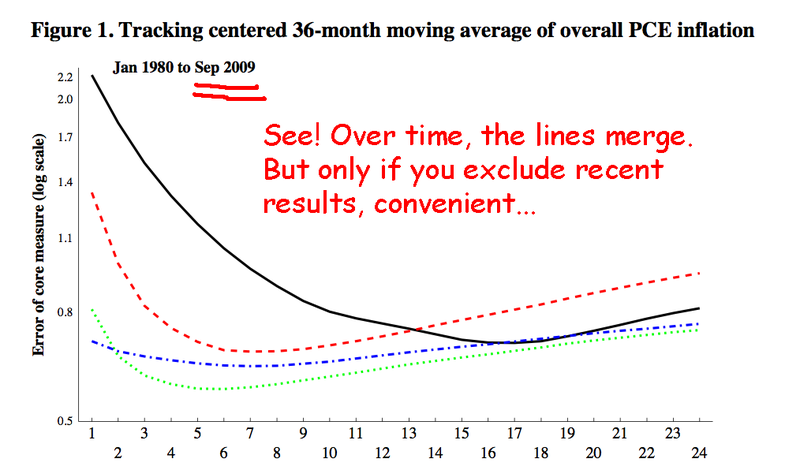 Basically, thinking at the Fed has been eliminated. The process has been automated. 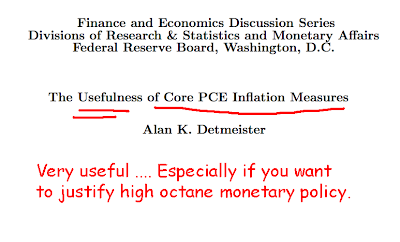 Bernanke has convinced the Fed board to adopt Core PCE as a determinate of monetary policy. So long as CPCE stays below 2%, Ben is going to have his foot planted on the monetary metal. It’s “full speed ahead” according to the Chairman. He’s pushed things off until 2014 – a very long time from now. 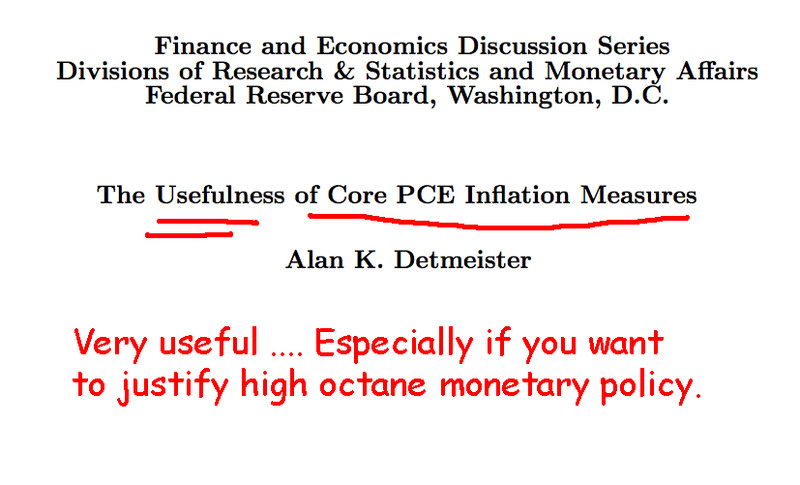 My question: “Why is the Fed using CPCE versus another measure of inflation?” The very good news is that there is answer, and it comes from a very “reliable’ source – The Federal Reserve. A detailed analysis on this topic was conveniently made public just a month ago. Information on CPCE and the other measures of inflation is available monthly. 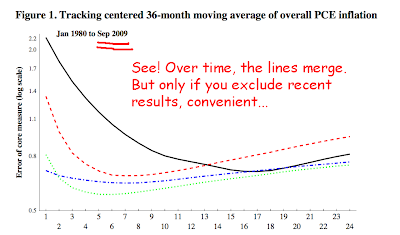 There’s no reason (that I can think of) why the Fed chose to deliberately omit two years of data that would conflict with the “desired’ conclusion. To me, it looks like the authors manipulated the report. I think the Fed made a mistake targeting inflation. It’s now stuck with the choice. It can’t go back on this without looking awfully stupid. The policy of allowing CPCE to determine the direction of monetary policy will last the until the end of Bernanke’s term at the Fed. 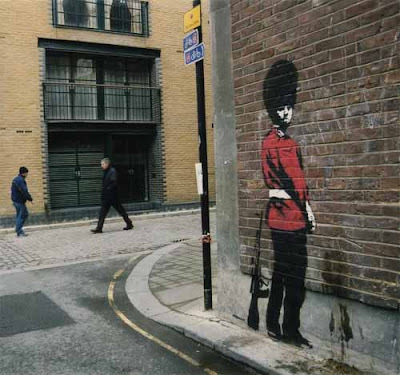 Then it will be abandoned in favor of more pragmatic approaches to decision making. I think there is enough monetary juice in the global system for there to be a risk of inflation north of 2%. We shall see. I think Bernanke is going to get his balls squeezed. He deserves that fate, he put them in a vise. As of today, he no longer has choices. He’s made himself a slave to a single dopey statistic. The markets are the best measures of how people perceived today’s announcements from the Fed. The dollar pissed on the Fed in general, the gold market hit Bernanke square in the face with an ingot.